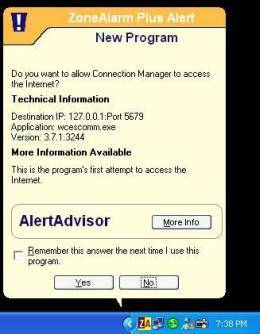 WcesComm.exe - Used for communicating between the PDA and the computer. WcesMgr.exe - This provides the interface for configuring synchronization settings. CeAppMgr.exe - Used during installing / uninstalling software on the PDA. Dbexport.exe - Used when you synchronize Microsoft Access database. How to Configure ZoneAlarm to allow ActiveSync? Different versions of ZoneAlarm is available. In the example given below, I am using ZoneAlarm Plus. The user interface in the other versions is similar so you should not find it difficult to configure the settings correctly. 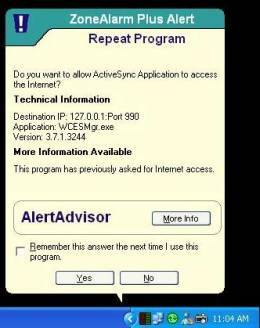 While synchronizing, Activesync will execute Wcescomm.exe and WcesMgr.exe. 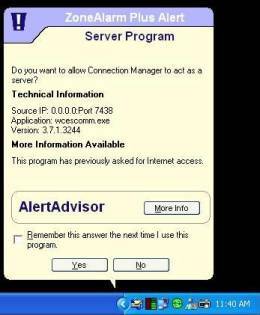 ZoneAlarm will list them as "Connection Manager" and "ActiveSync Application". Here are the settings that you would need to set for ZoneAlarm to allow ActiveSync to synchronize successfully. 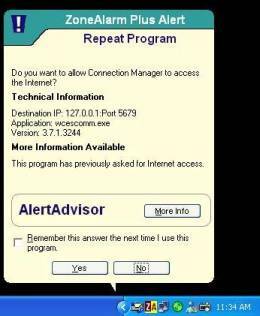 Step 1: Open ZoneAlarm and go to the Program Control. Step 3: You have the option to set it to ask permission every time the program is executed or allow it permission to access the Internet and also act as a server. You can click in the Access and Server area to change settings (a green check means it has automatic Access, a question mark means that the program has to ask every time, and a red X means No Access). Ensure you have the green tick on so that you grant both the applications permission to access the Internet. This will prevent the firewall from blocking the port during synchronization. Disconnect the PDA from the computer. Connect the PDA once again and you will witness the series of Pop-ups I have explained earlier. Click Yes to give permission to the applications. You could check the tab to remember the setting so that you are not prompted again. I hope this article clarifies the different applications that ActiveSync uses during synchronization and helps you configure your firewall settings correctly.